When you are tired after work, you can turn off all lights at home, then enjoy the fantastic private world and rest yourself or your wife, girlfriend at the peaceful wonderful night. Prepare to be hypnotised by the enchanting beauty of the moon – in your room! Meet the Enchanting Moon Night Light. Made with 3D technology, you can now realistically experience the out-of-this-world light and mystery of the moon, right where you are. The lithium ion battery emits 0-5W, is rechargeable and USB compatible (cable included without adapter) allowing you to enjoy the everlasting light of the moon to your heart’s desire. Just as the moon changes, this night light features LED bulbs that project white and yellow light, able to suit your mood at the touch of a button. While you dream on in outer space, the night light is taking care of mother earth – odourless, non-toxic and environmentally friendly. The perfect gift for family and friends of all ages, share this unique gift with your loved ones and enjoy the experience together. The power of the moon, now in the palm of your hand – order the Enchanting Moon Night Light today! Special gift for wife, girlfriend, lover, family members, friends, classmates, kids and so on. 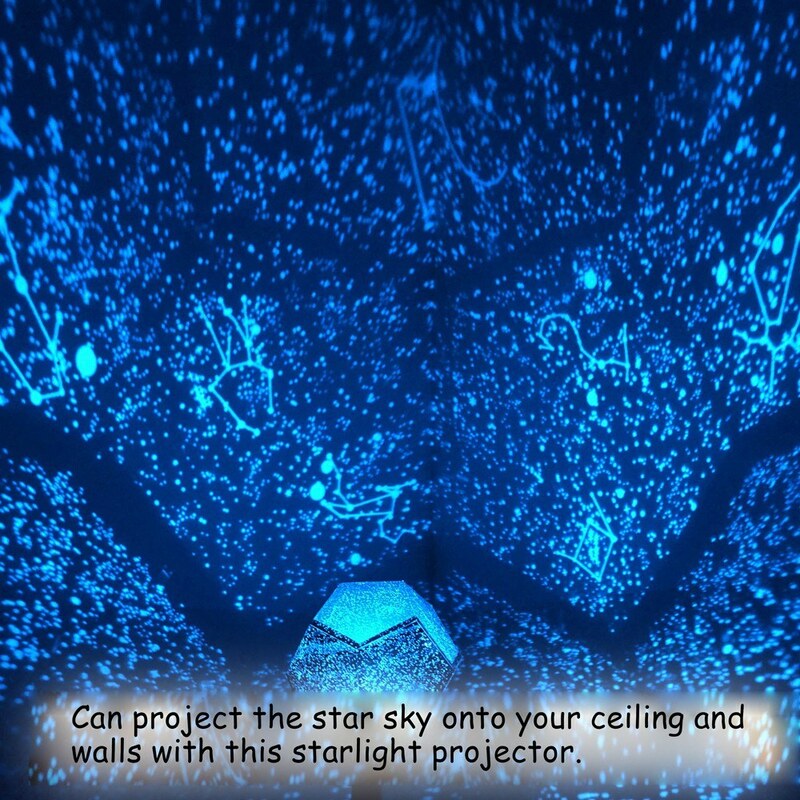 Can project the stars onto your ceiling and walls with this starlight projector. It's fully adjustable so that you can change it to accurately track the movement of the stars as the year goes on. Easy to DIY and install. Featuring the rotating base with compass-point alignments which can be used to align and set up the stars according to your location and the time of the year so you can see the stars more clearly. Can choose three colors of light: warm, blue, white. 1-3cm size difference is allowed due to manual measurement. Make sure all room lights are off, and casting images located in white walls or ceilings for best results.